It is 1922. Two women take a train journey. Louise Brooks is a beautiful 15 year old from Wichita, Kansas, taking up the chance of a lifetime to study dancing in New York City. Her companion, Cora, is a 36 year old housewife, and seems respectable to the point of being dull. This summer will change the lives of both women. Louise Brooks was a real person – she had a brief career as a start of silent movies, but is still remembered, with her trademark glossy dark bobbed hair, as the epitome of 1920s glamour. I learned quite a lot that was new and interesting to me about her life, and what happened to her after her period of fame. However, this is a novel, and the real story, as the title suggests, is that of the chaperone, Cora Carlisle, a fictitious character. I found it a fascinating and enjoyable story. The narrative is from Cora’s point of view, and Moriarty includes some biographical detail of Louise Brooks. She has little apparently in common with her charge, who turns out to be a brat with shocking behaviour, getting drunk with strange men. Cora tries to curb and protect her behaviour without much success. At the same time, Louise is very bright, with highbrow reading tastes. I had believed a popular myth that Brooks’ career was brought to an end by the introduction of “talkies”, that her speaking voice was terrible. In fact, she refused to go along with studio system expectations, was perhaps too clever and argumentative, as well as badly behaved. She lived into her 70s and after various failures found some success and respect as a film critic. Cora turns out to have a motive for taking on the chaperone’s role – it is an opportunity to escape from a stifling home life, but more importantly, to try and find out more about her origins – she was adopted as a child from an orphanage in New York City. This summer will turn out to be just a start to her on a voyage of discovery. I enjoyed the various shifts in the relationship between Cora and Louise, both over the summer and in occasional encounters later in their lives, when Louise has grown up. They have very different outlooks on life and will never be best friends exactly, but they make each other think. I wasn’t sure that all the story of Cora’s later life, told in the last third of the book, was believable – though it was a great story and I wanted to think it could have all turned out that way. Still, I loved the way Moriarty develops her as a character who remains outwardly respectable but is inspired to pursue her own way forward to a much more satisfying life. I also enjoyed the look at social history in the US through Cora as a character. This novel was a terrific and memorable read. 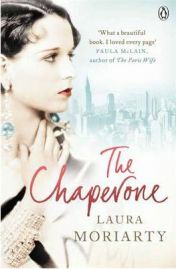 No Comments on "The Chaperone"